Black Hoosiers in the 1900’s enjoyed the same leisure activities embraced by their white counterparts, but were systematically denied access to many of the venues associated with recreation. The Great Migration of African Americans from the south in the 1920s and 1930s increased Indiana’s black population from only 2% of the state’s population in 1900 to over 3.5% by the beginning of the 1930s, putting a larger spotlight on concerns over segregation and access to recreational facilities. Segregation led to black Hoosiers creating their own organizations, businesses, and communities where they could fully participate in popular past-times. Although the County Club of Indianapolis, opened in 1891, and following country clubs and golf courses were segregated, the Douglass Park Golf Course (named after Frederick Douglass) allowed black Hoosiers to use the course since its 1922 opening. 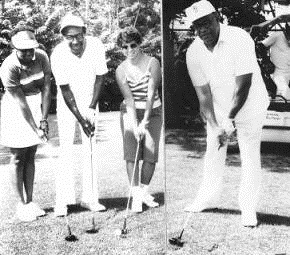 Even after desegregation, the golf course remained a popular spot for black residents of Indianapolis. The Douglass Park Family Center also pays homage to black Hoosiers with a painted portrait of Frank R. Beckwith. Beckwith was a popular advocate for African American rights in Indianapolis. He was also the first African American to run for U.S. President. Indiana Division of Historic Preservation and Archaeology, “Douglass Park Golf Course,” Discover Indiana, accessed April 25, 2019, https://publichistory.iupui.edu/items/show/356. Published on Feb 15, 2018. Last updated on Apr 2, 2019.